It is no small feat that Marie Selby Botanical Gardens managed to provide a new perspective on an exhaustively studied painter and perennial favorite of the art world. 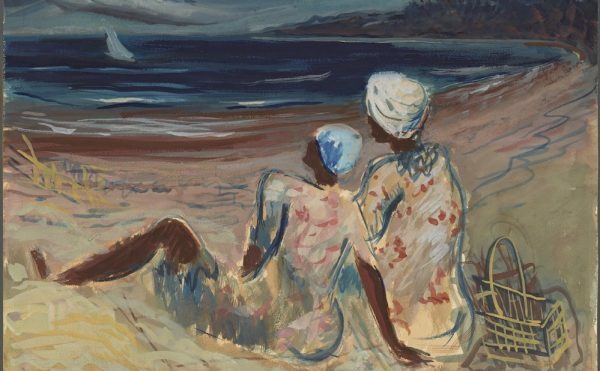 SARASOTA, Fla — Russian-French painter Marc Chagall has been considered many things — a Surrealist, a colorist, a modernist — but never really a naturalist. 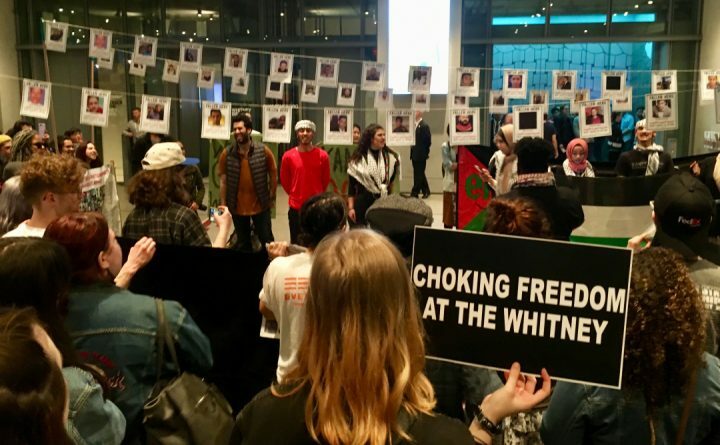 Yet that’s the tack that was taken by the Marie Selby Botanical Gardens as they approached the construction of an exhibition presenting several of the artist’s works. 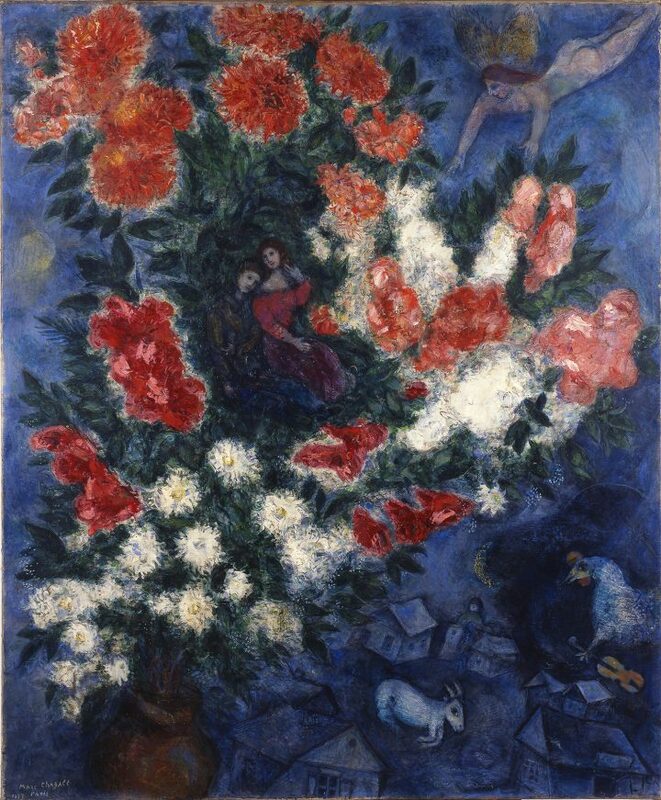 The result, Marc Chagall, Flowers, and the French Riviera: The Color of Dreams, may sound initially gimmicky but gains conceptual momentum the further one explores the living tableaux staged within the Selby conservatory and grounds. “If you start looking at his work, you’ll see flowers all the way from 1919 to his death in 1985,” said Mischa Kirby, Director of Marketing and Communications for Selby Gardens, on a tour through the exhibition. 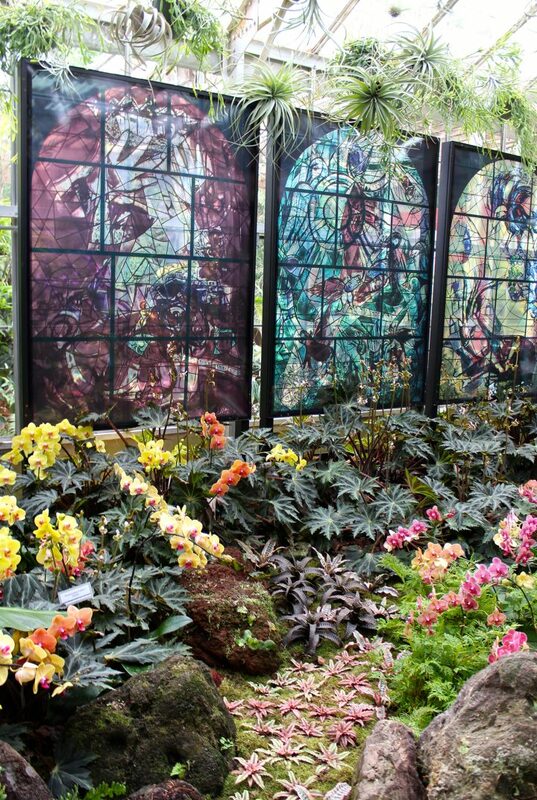 Plasticized reproductions of some of Chagall’s stunning stained glass works act as backdrops and points of inspiration for installations created out of living materials by Selby’s horticultural and floral design teams. These scenes within the conservatory are titled “A Cathedral of Plants,” and they are the welcoming salvo intended to forge a connection between Chagall’s works and their botanical inspiration. 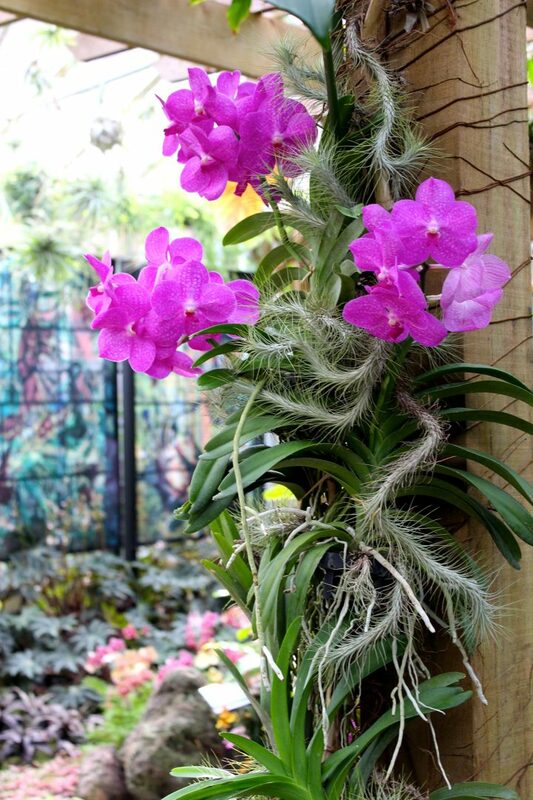 Selby Gardens, which became a botanical garden in 1975 after being left in trust by philanthropist and gardening lover Marie Selby, is devoted to the study of epiphytes — plants that grow harmlessly on other plants. 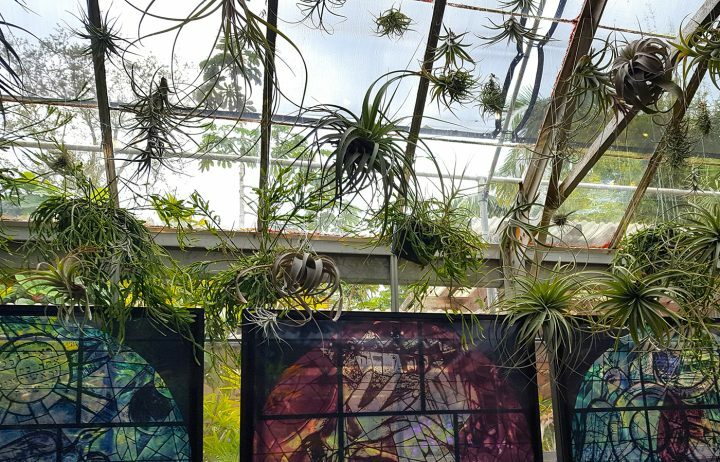 These include bromeliads, orchids, ferns, and “air plants” like Spanish moss, all of which thrive in Florida’s warm and humid environment. Specimens among Selby’s area of interest offer dramatic colors and shapes for their exhibition designers to work with when constructing the installations, as well as the unique ability to present features hanging in air. “In a lot of Chagall’s work, there are elements that are floating, so that was something we could play with and have fun,” said Kirby. 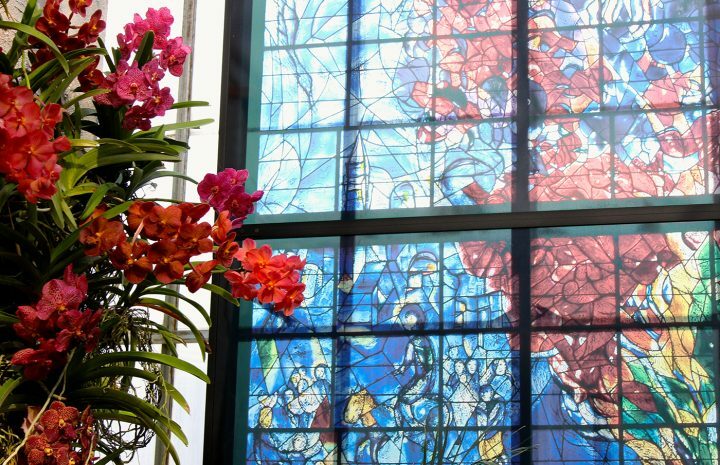 Above a series of four faux-stained-glass windows reproducing selections from The Twelve Tribes of Israel from Abbell Synagogue in the Hadassah Medical Center in Jerusalem, a field of hanging Tillandsia represent a starry sky. A lush moss creek studded with bromeliads is meant to suggest their reflection on the water’s surface. 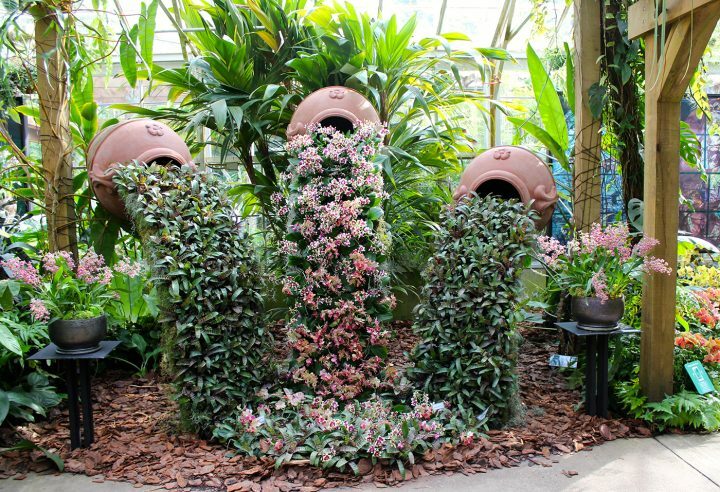 Nearby, three giant terra cotta vessels poised roughly shoulder-high “pour” out converging streams of green bromeliads and dappled orchids. 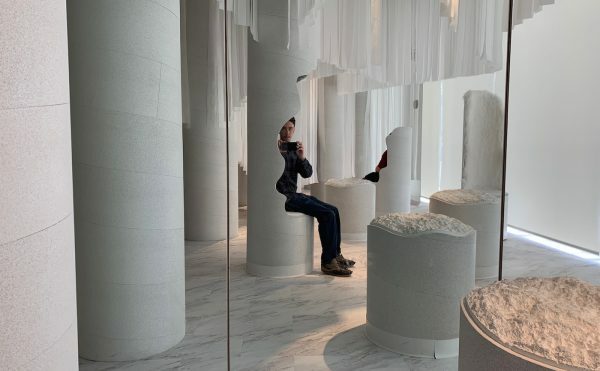 “There’s a lot of really beautiful thought that the team that does the [horticulture] design put into this,” said Kirby, a sentiment echoed by Ockman, as she considered the implication of working to make art of living materials. All around the lavish grounds, which surround the surprisingly modest house — once home to Marie and her husband William Selby, a partner with his father in the Selby Oil and Gas Company — efforts have been made to evoke the French Riviera, one of Chagall’s beloved haunts. 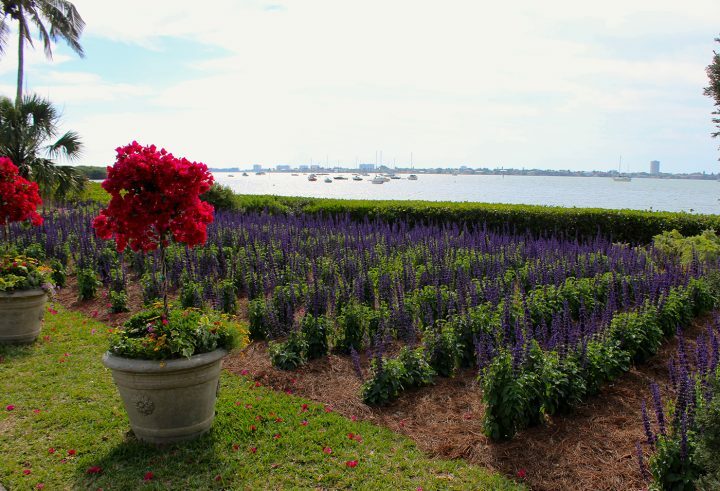 Along the garden’s view of Sarasota Bay, a field of salvia has been planted to visually evoke lavender plantations. 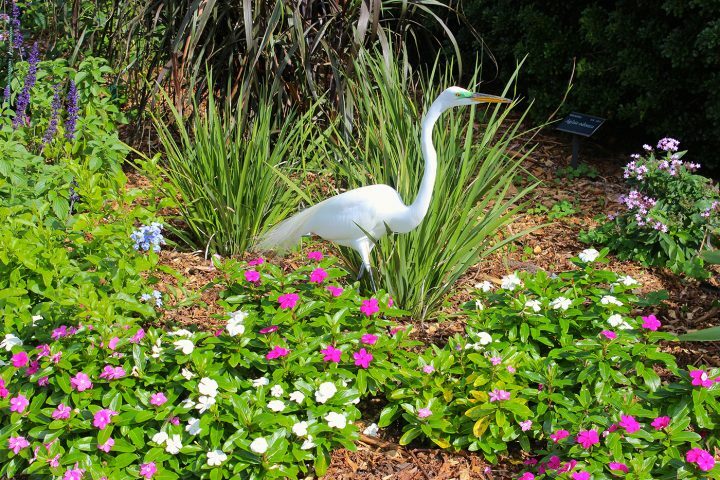 In placid pursuit of the pollinators attracted by the neat rows of purple flowers, a massive snowy egret saunters the grounds, unruffled by passing admirers. One can stand close enough to see a smear of iridescent green highlighting its eyes, and with its graceful black legs and lacy tail feathers, it looks for all the world like it stepped right out of one of Chagall’s whimsical compositions (though, in fairness, the artist did seem to favor chickens). In fact, the paintings risk feeling a bit flat, compared with such dramatic competition, but there is an appealingly intimate opportunity to view them inside the architecturally ambitious Payne Mansion, which was annexed by the Gardens in 1973 and is now home to Selby’s Museum of Botany and the Arts. “The Lovers” (1937), one of Chagall’s best-known works, is on loan from the Israel Museum, Jerusalem, but two small pieces, on loan from an anonymous private collector, reinforce the idea that Chagall’s fascination with flowers stayed with him throughout his career — a concept affirmed by his granddaughters, one of whom works as a floral designer and consulted on the particulars of this exhibition. “Bouquets of Lilacs at Saint-Paul” (1978) is about as straightforward a still life as one can expect from this champion of surreal compositions — in this case, taking center stage, with views of the titular village and Chagall’s home for 19 years only glimpsed in the distant background. 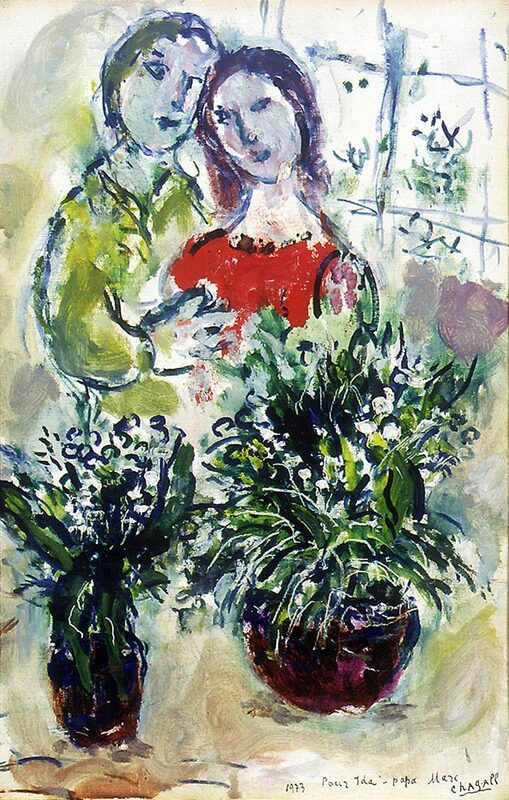 Likewise, “Couple with Lilies of the Valley” (1973) features two lovers entwined — a popular subject for Chagall — seemingly paying rapt attention not to each other, but to some vases of flowers that stand between them and the viewer and are thus the focus of the painting. 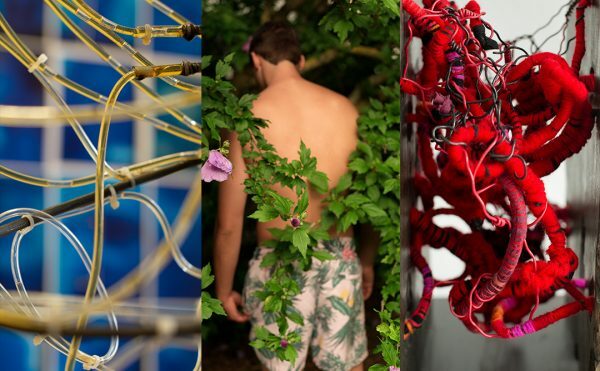 “I learned a lot about plants in curating this show, which I might have predicted,” said Ockman. 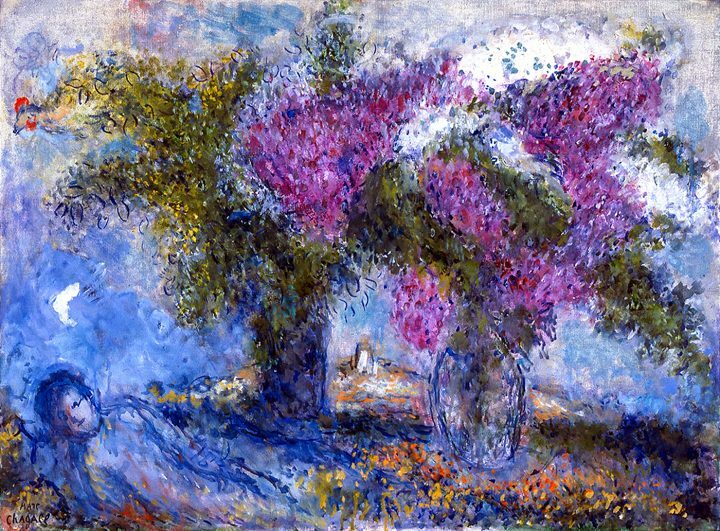 “What I hadn’t expected was how that experience would alter the way I look at Chagall’s flowers.” Having seen the case made by Selby Gardens, one comes away with an unshakable sense that Chagall was more or less obsessed with flowers. Setting aside the incomparable aesthetics, it is no small feat on the part of Selby Gardens to have managed to provide a new perspective on an exhaustively studied painter and perennial favorite of the art world. 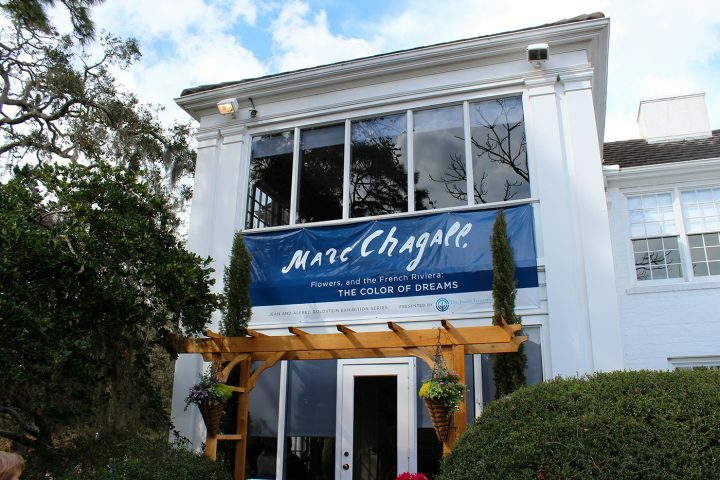 Marc Chagall, Flowers, and the French Riviera: The Color of Dreams continues at the Marie Selby Botanical Gardens (811 South Palm Avenue, Sarasota) through July 31. Selby Gardens provided partial reimbursement for the author’s travel expenses.